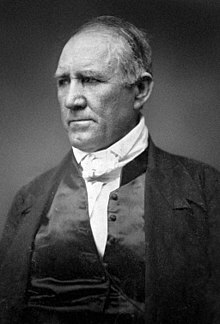 Samuel "Sam" Houston (March 2, 1793 – July 26, 1863) was an American statesman, politician, and soldier. He is best known for his leading role in bringing Texas into the United States. Houston, Texas and Sam Houston State University was named after him. Shortly afterwards, he relocated to Coahuila y Tejas, then a Mexican state, and became a leader of the Texas Revolution. Sam Houston supported annexation by the United States. When he assumed the governorship of Texas in 1859, Houston became the only person to have become the governor of two different U.S. states through direct, popular election, as well as the only state governor to have been a foreign head of state. Houston was born on March 2, 1793 in Rockbridge County, Virginia. He was of an Irish-Scottish descent. Houston was married to Eliza Allen from 1829 until they divorced in 1837. Then he was married to Diana Rogers Gentry until they divorced. Then he was married to Margaret Moffette Lee from 1840 until his death in 1863. Houston had seven children. Houston died on July 26, 1863 in Huntsville, Texas from pneumonia, aged 70. Wikimedia Commons has media related to Sam Houston.